In 2014, I participated in the 45th Secondary Students Research Projects competition organized by TUBITAK with my project titled “From Wood Fibers to 2-D Code”. As a result of the detailed researches I conducted on wood fibers for the competition I participated under the lead of my school Enka, I decided that a security system could be established by documents. According to archeological findings, the first known paper was produced in China in the second century B.C. The raw material of paper, which has undergone many changes until today, is acquired from wood fiber. Plant fibers are obtained from the nature and have different forms as a result of the perfection of nature. Trees, which are the most common raw material utilized today, were used for the first time in 1870. Modern paper consists of the cellulosic fibers released during the manufacturing of the paper-mache being dried and bonded to each other with weak hydrogen bonds. The project is based on the hypothesis that cellulosic fibers will constitute the paper by creating shapes that are different from each other in microscopic dimensions and that the papers can be distinguished from each other using these shapes. Based on this data, I thought that it is possible to identify the papers and to render them secure by distinguishing them from each other. In the project, I acquired the data required for the testing of the hypothesis by observing different areas of the same pieces of paper and different pieces of paper by means of a microscope connected to a computer. The microscope used is capable of magnifying maximum 200X. The data acquired from the observations performed supported my hypothesis. The microscopic images of the same areas of different pieces of paper and different areas of the same paper were not identical. The microscopic image I acquired from a certain area of a piece of paper and was shaped by the cellulosic fibers in its structure was a key that distinguished that piece of paper from others. Just like the fingerprints of people are not identical, the images of the pieces of paper are not the same. For this reason, this image can be termed the fingerprint of paper. In my project, I turned the fingerprint information of a piece of paper into 2-D code and printed it on the same piece of paper. This way, the fingerprint of a piece of paper was registered onto the same piece of paper. In a document that was copied or reprinted, the 2-D code would remain the same but the fingerprint would change because the piece of paper would change. As a result I was able to complete my project which proved that the comparison of the fingerprint with the information stored in the 2-D code would allow whether the piece of paper is original or not to be determined and thus valuable papers would be rendered secure against being copied. There are situations where it would be inappropriate if the documents printed on paper are modified, then reprinted, or copied. Therefore, is it possible to identify if a document printed on paper is copied or reprinted, in short, whether or not it is the original document? This study encompasses research of the methods that shall allow identification of whether or not the documents are printed on their original paper and those that could prevent duplication of such documents. Due to the fact that their raw materials are natural, papers have a structure that allows them to be distinguished from one another. By examining this structure, papers can be identified and distinguished when required. The process to be applied for data collection shall be to examine the natural structures of papers under a microscope. The data, which could support or disprove the hypothesis, shall be gathered from the microscopic images to be obtained from different papers. It shall be required to store the microscopic images in order to perform a comparison. For this reason, it shall be purposeful to use a digital microscope that can be connected to a computer. As the data to be collected is composed of images, a visual analysis shall be conducted. It is possible to define an image as a digital quantity that can be stored in a computer environment. For this reason, software may be used in a computer environment to compare microscopic images and conduct a visual assessment. The project aims to find a method that shall provide protection against copying and reprinting of paper documents and that shall allow the determination of the authenticity of said paper. In addition to this, it is also aimed to convert this method into a practical method that can be used for valuable papers. Studies carried out for the safety of paper used in important documents have continued from past to present.. The first known application for secure paper was made in 1914. In this application, a special material was mixed into the pulp, and visibility of the contents through the envelope was prevented . Watermark (wavelet) application : Watermarks can be seen under special lighting. Using a colored or patterned font: The text background is not left plain white, it is written on a background picture or tone. Writing in microscopic scale . Using metal threads inside the paper. Using materials that change color under ultraviolet (UV) light. Today, there are many companies that produce paper using the methods mentioned above in order to prevent copying of money and valuable papers [4-6]. Industrial studies are also continuing to allow determination of authenticity of any paper instead of using the costly produced security papers. It is known that Fuji Xerox Company is working on development of the Paper Fingerprint Recognition Technology . This technology is based on the fact that the raw material in the pulp used in papermaking is fibrous and these fibers are randomly placed when the paper is produced. Differently from my project, the Paper Fingerprint Recognition Technology stores the fingerprints in a database. If the authenticity is desired to be tested, the record of paper in the database is compared with the then obtained fingerprint. However, in this project, the fingerprint information is not stored in a database, but printed on the paper in a QR code. This eliminates the need for storing the fingerprints in a location for control purposes. In order to provide full security, the fingerprint image should be encrypted and converted into a QR code. A study where the paper fingerprint is identified by lighting from the top  is present. However, according to this project, bottom lighting of the microscope is used. By this means, we are not affected by the changes that occur in top lighting in different environments. The same fingerprint image can be obtained in almost every measurement. The ability to realize the project using simple devices and elimination of the need for complex systems like databases and special printers make the proposed method practical. 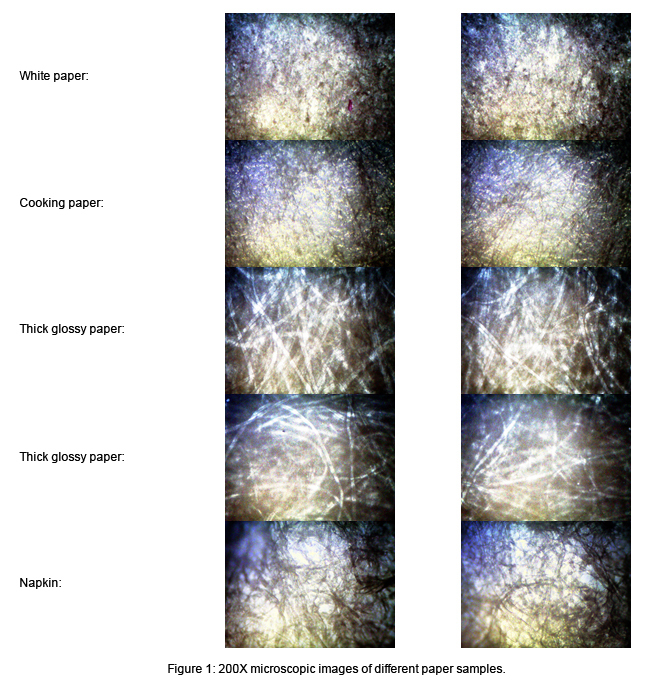 Initially, different types of paper have been examined under a microscope in this project. The samples examined are given in Annex 1. 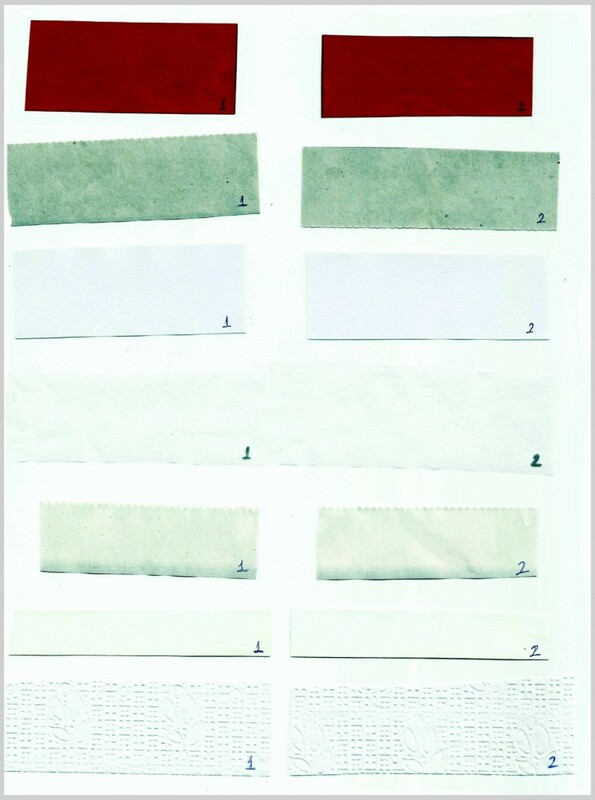 The microscopic images of red cardboard, newsprint paper, white paper, cooking paper, thin glossy paper, thick glossy paper, and napkin samples are given in Figure 1, from top to bottom, respectively. The observations made on different papers have supported my hypothesis that the papers can be distinguished by their fiber structures. According to this project, the following steps were taken to convert the paper fingerprint into QR code and record it on the same paper. 1.First, the area of paper to be examined under a microscope is marked on the paper. For this purpose, a small gray frame is printed on an area close to the edge of the paper. By this means, the fibrous microscopic image that shall constitute the fingerprint of the paper is obtained from the white area in the middle of said gray frame. This same frame is used both when preparing the QR code of the paper and when testing the paper later on. 2.The paper is placed under the microscope so as to display the printed frame. 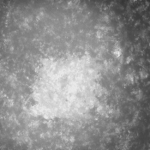 The digital image of the empty space in the middle of the frame is recorded with the highest magnification amount possible (200X in this project). The contrast and brightness values of the image are set to maximum values. In this manner, a better view of the fibers is achieved. A sample image is given in Figure 2. Figure 2: The image obtained from the microscope. The white area in the middle of the gray frame is seen. 3.In order to generate the QR code for the recorded image, the image size should be reduced and converted into the smallest size image file that can represent the fibrous structure. For this purpose, the white area in the middle of the gray frame is cropped using an image editing program, converted into a colorless image, and the contrast value is increased again. Thus, the image in Figure 3 is obtained. Figure 3: The cropped white area with increased contrast. 4.The size of the image is reduced to 30×30 pixel dimensions, the contrast is increased again and it is converted into a three-tone image (white, gray, and black). The resulting image is given in Figure 4. 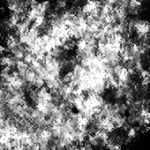 Figure 4: The fingerprint image composed of three tones and in 30×30 pixel dimensions. 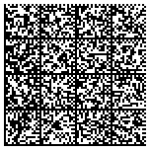 5The fingerprint is converted into a QR code using an available QR code generation program called ‘dmtxwrite’. The generated QR code is shown in Figure 5. Figure 5: The QR code containing the fingerprint. 6.The QR code is printed on the back of the paper, fingerprint of which is obtained. In this way, it does not constitute an obstacle for the document contents on the front side. As of the moment when the QR code is printed, the authenticity of the paper is protected. In order to check, at any time, the authenticity of the paper is original, the QR code is scanned with a scanner. It is cropped using an image editing program so as to leave a white frame around the image and the date it contains is decoded with an available program called ‘dmtxread’. As a result of decoding, the fingerprint image in Figure 4 is obtained. Afterwards, the fingerprint frame is again taken under the microscope and the procedures in steps 2 and 4 are repeated. The fingerprint image acquired for a second time is given in Figure 6. As a result, it can be determined that the paper is original according to the amount of similarity between the images given in Figure 6 and 4. Figure 6: The fingerprint image acquired for a second time for control purposes. Every time the original paper is examined under a microscope, images resembling the fingerprint image stored in the QR code are obtained. However, if the paper is copied or reprinted, results that are not similar to the fingerprint stored in the QR code are obtained in the imaging operations performed for testing purposes using a microscope. Application of the method requires a printer, scanner, digital microscope, image editing program and a program that can generate and decode QR codes. The conditions where the method is valid and successful are described under the section titled Conclusions and Discussions. 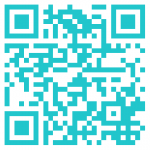 As described in the method, a quality microscopic image should be acquired first for a successful QR code generation. The white space within the frame should be apparent, however, the frame should not be printed too dark. The reason for this is that a dark frame causes lighting of the details within the white area to an extent that they disappear. The different frame darkness and white area width values tried are given in Figure 7. 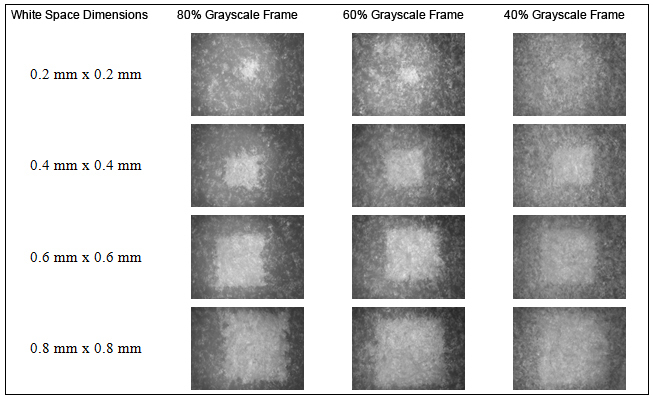 Looking at the data given in the figure, it has been decided in the study to print the frame in 60% grayscale and leave a 0.4 mm x 0.4 mm empty space. When the empty space is small it shall reduce the size of the fingerprint, and as a result the size of the QR code shall also be reduced. All images in Figure 7 are recorded with 200X magnification. 200X is barely sufficient to identify the fibrous pattern of white paper. The images recorded with lower magnification values of the microscope are given in Figure 8. 10X and 60X are not sufficient to identify the fingerprint of the paper. The fibers, bulges and other patterns with close colors within the white area only become recognizable after it is edited in an image editing program. The Equalize function of the image editing program GIMP was used in the steps 3 and 4 described under the Method section above. In this way, the light tones are ordered towards full white and the dark tones towards full black, and the contrast in the image is increased. When this procedure was not applied, it was not possible to recognize and compare the fingerprint image. The QR code can be printed in different sizes depending on the printer being used. Different sizes of the same QR code are shown in Figure 9. A 3 cm x 3 cm sized QR code can be printed properly in an inkjet printer, scanned and decoded. QR codes with smaller sizes cannot be decoded. More successful results have been obtained with a laser printer. A 1.6 cm x 1.6 cm (depends on supported resolution of the printer used)sized QR code printed with a laser printer can be decoded successfully. Scanning a 3 cm x 3 cm QR code printed with an inkjet printer in 300 DPI resolutions is enough for successful decoding. However, scanning in 600 DPI resolutions is required to decode a 1.6 cm x 1.6 cm QR code printed with a laser printer. When the QR code is scanned in a resolution lower than specified, the QR code decoder program fails and the fingerprint image stored in the QR code cannot be obtained. Finally, fingerprint images of four different papers and the QR codes containing these images are given in Figure 10. 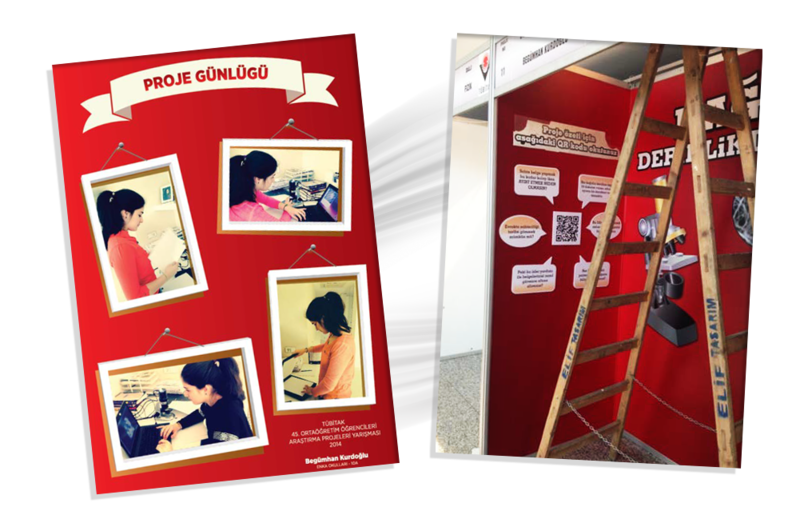 In this project, identification of papers according to their physical characteristics, using commonly used devices (printer, scanner) and an easily available digital microscope has been successfully achieved. After a fingerprint that belongs to the paper is identified, this information is recorded on the same paper with a QR code. In this way, data stored in a remote computer are not required in order to determine whether or not the paper is original. The paper’s identity can be checked at any time using a microscope and scanner. A device, which shall automatically recognize the fingerprint and print the QR code on the paper, can be developed for practical use of the results obtained in this project. Using this method, exam papers, contracts, and documents received from government agencies, bank documents, identification certificates, letters and tickets can be secured in a cost-effective way against copying and reprinting. The concerning competition takes place at the international level each year with the participation of high school students. The results of the competition are evaluated in three different categories, namely Research Paper, Contributions and Instruments. 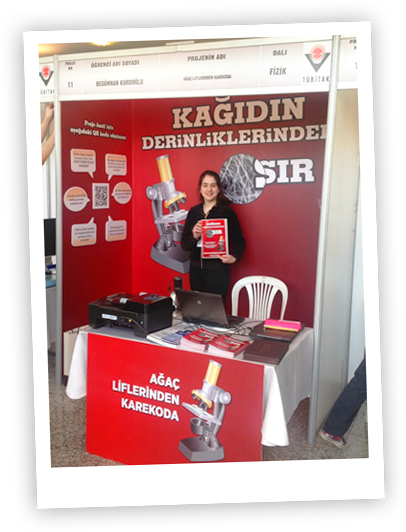 The competition targets the high school students that want to introduce their studies in the field of Physics. 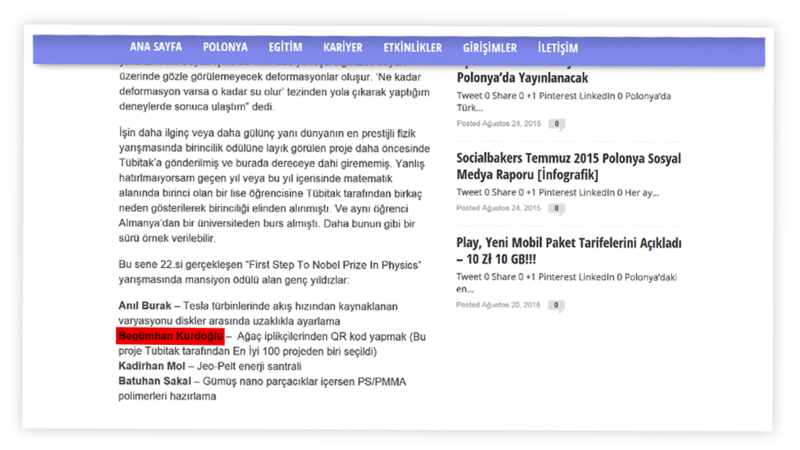 Poland Science Academy Physics Institute has organized the 22nd competition in the 2013/2014 academic year. The name of the competition makes a reference to the award that is the dream of all physicists, particularly young physicists. 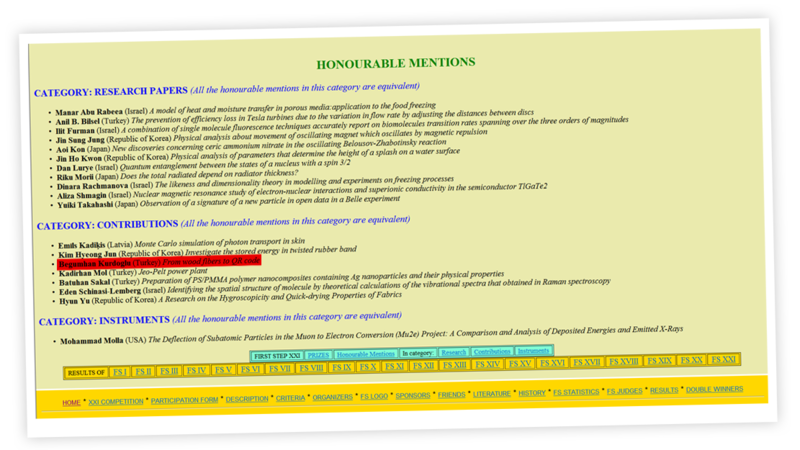 I succeeded in entering the “Honorable Mentions” list in the Contributions category with my project titled From Wood Fibers to 2-D Code. Google Science Fairis a global online science and technology competition that is open to individuals and teams of ages 13 – 18. The purpose of the Google Science Fair is to support young scientific talents and to provide the opportunity for the students throughout the world to display their ambitious ideas. 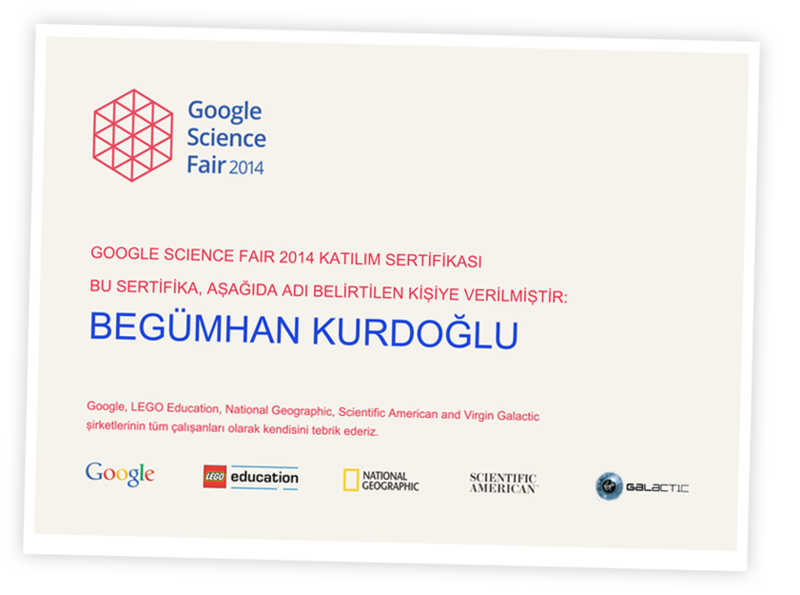 I was awarded the certificate, an example of which is provided below, in the Google Science Fair organized this year (2014).